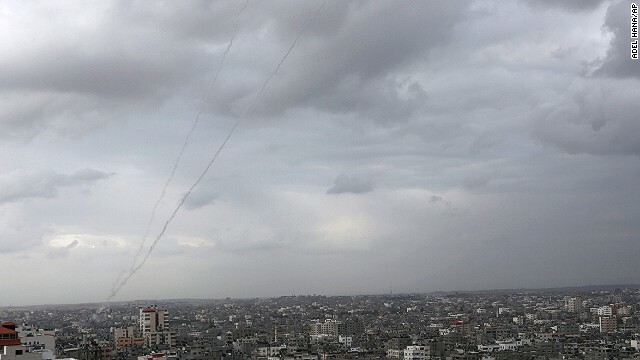 Gaza City (CNN) -- After two days of rocket fire from Gaza into southern Israel and attacks by Israel on Gaza, a cease-fire has been declared, an Islamic Jihad leader told CNN Thursday. "We have agreed on an Egyptian-brokered truce -- as long as Israel commits to it," said the leader, Khaled Al-Batash. Sources said the truce started at 3 p.m. (9 a.m. ET). But, two hours later, Israeli police spokesman Micky Rosenfeld said two rockets had been fired from Gaza in the direction of Ashkelon. There were no immediate reports of damage or injuries. A spokesman for Israeli Prime Minister Benjamin Netanyahu said he had no reaction to the cease-fire declaration. But the Israelis seemed to be preparing for continuing violence, with the IDF calling up reservists to man Iron Dome batteries that are intended to intercept missiles from Gaza, according to a spokesman. They intercepted three such missiles Wednesday night. Islamic Jihad said the flare-up came after three of its operatives were killed Tuesday by an Israeli military strike in Gaza. The operatives had traveled to Gaza to inspect an Israeli drone -- a small surveillance aircraft -- that had become disabled, Islamic Jihad said. Palestinian Authority President Mahmoud Abbas blamed the Israelis for the outbreak. "The Israeli occupation forces killed in cold blood three Palestinians in the West Bank and another three in Gaza, and we did not hear any condemnation or any apologies to these acts from the Israeli government," he said Thursday in a joint news conference in Bethlehem with British Prime Minister David Cameron. "And yesterday the launching of rockets happened from Gaza and Israel retaliated to that, and we condemn this escalated military aggression in all its forms, including the firing of rockets," he told reporters, according to the Palestinian news agency WAFA. Israeli Defense Minister Moshe Yaalon blamed the attacks on Hamas, which has governed Gaza since 2007, two years after Israel disengaged unilaterally from the area. "The Hamas is responsible for Gaza and if the Hamas does not know how to ensure the quiet, they will also be responsible," he said in Hebrew. "We are prepared for all possibilities." Israeli Foreign Minister Avigdor Liberman told Israeli army radio that "the position of my party Israel Beitanyu is that we support the full occupation of the whole of Gaza in any possible future action." Liberman opposed a response short of full occupation. "I am against a limited operation," he said.